The SeatMate™ Stadium Pack is a patented seat cushion and pack that is the only one of its kind. Designed specifically for professional stadium seating, it features a simple, easy-to-use design that secures it to the seat yet allows the seat to be flipped up or down while SeatMate stays in place. 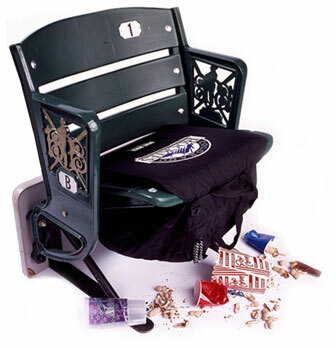 It keeps stowed items secure, safe from inclement weather, and away from the spilled beverages and food scraps on the stadium floor in easy-to-access zipper pockets along with a clean, dry, cushioned seat for increased comfort! Large, partitioned zippered compartment for jackets, snacks, etc. Two zippered security pockets for keys, phone, wallet, etc.